I have a .jpg image of an outdoor sign that when zoomed to 400% shows the white text of the sign quite blurred. I am hoping to find the proper way to sharpen and whiten just the white text and leave everything else on the image as it is, i.e. slightly blurred. I have attached the file in question so you can see for yourself what I am talking about. The border and empty space surrounding the image must remain as seen so as to have the correct size for posting to a Yahoo! Page. Many thanks to those members who may help me out. Lots of jpeg artefacts. The image maybe exported at low quality / scaled up from a tiny image. 1. 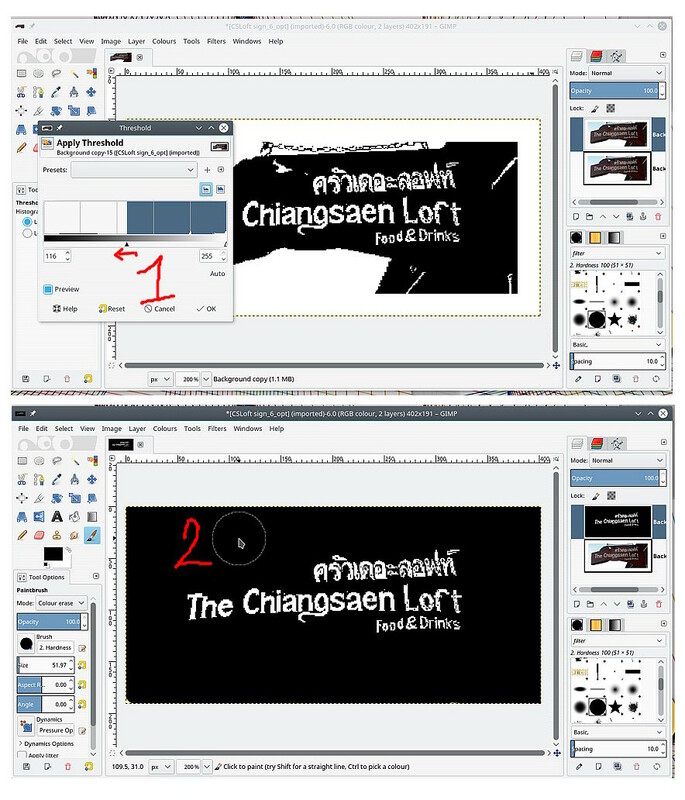 Duplicate the image layer Layer -> Duplicate Layer and in the new top layer use the Threshold tool Colors -> Treshold Move the center slider a little to the left to make white areas whiter. 2. Paint out in black all of the background leaving the text. 5. Exporting as a new jpeg? Untick all the exif stuff. Do you need that comment? Otherwise default values give a file size much the same as the original. edit: I wish I could give some simple way to improve that overall. Guessing at much of the jpeg artefacts actually come from over-sharpening. A partial reconstruction, scale the image up 400% then clean up, scale back down to original size, new borders to finish. Not a quick process. Gets this. 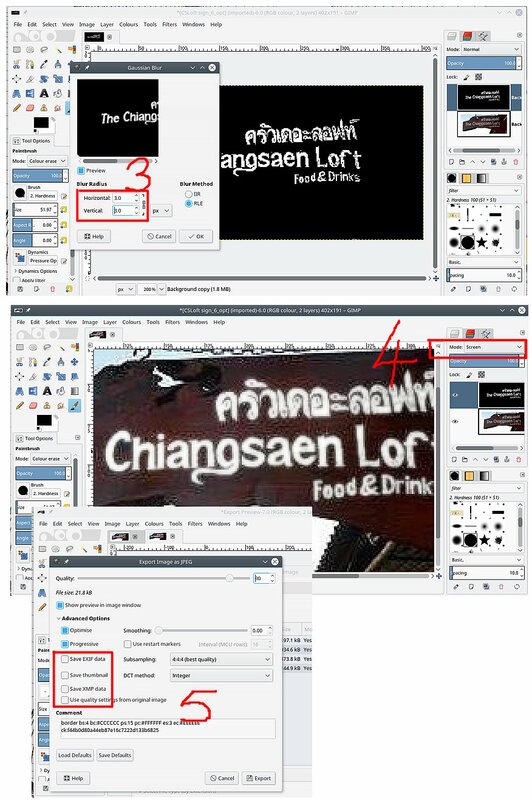 (01-15-2019, 09:01 AM)rich2005 Wrote: Lots of jpeg artefacts. The image maybe exported at low quality / scaled up from a tiny image. Many thanks for the suggestions and a peek at the finished product. I will print out your post and use its contents as I try my hand at sharpening the white text of the jpg in question. I'll keep my fingers crossed as I move through the steps since I'm quite new to GIMP. But the last picturein your post really does sharpen the white text and makes it very legible indeed.